Aktuelles > Neuigkeiten ausführlich > Bundeskanzler-Stipendium > Projekt-Tagebuch 1 | Kompetenzzentrum Grosssiedlungen e.V. My research about the large housing estates started from November, 1st. Last week I spent in the areas on in East Berlin – Mahrzahn and Hellersdorf. Together with Ralf Protz we met a few practitioners, working with this topic. The history of the further development of the large housing estates has been lasting around 40 years already. So right now I am swimming in the ocean of the information (and many books on German), which I need to structure and create a few «products» that could be useful for professionals in Russia. -the history of real estate transformations: the environment in Hellersdorf is so different from the neighborhoods on the city edge in Russia now and it seems that it’s impossible to reach the same level. In this case, it is important to now that in the beginning the environment looked almost the same and the discussions about the future of the neighborhood started in the situation when the city hadn’t money for reconstruction yet. 2) Also I understood, that it would be useful to collect samples of the building’s reconstruction. For example, in Mahrzahn, where the most buildings are 7-11 floors high, that is more similar to Russia, were implemented a lot of measures for adding a new volume - corner sections, “closing block“ sections, alternative residential topologies. I am planning to create a map with short technical information. It could be also useful to map social innovations and the design of public space. 1. In spite of locating on the city edge, the morning train in Hellersdorf is full of young people, They are the students of the Alice Salomon University for social work, public health and early childhood education. 2000 student coming every day in Hellersdorf make the neighborhood’s center really livable. 2. The idea of relocated university was a part of the strategy to bring more functions in the neighborhood that meaningful for the whole city. 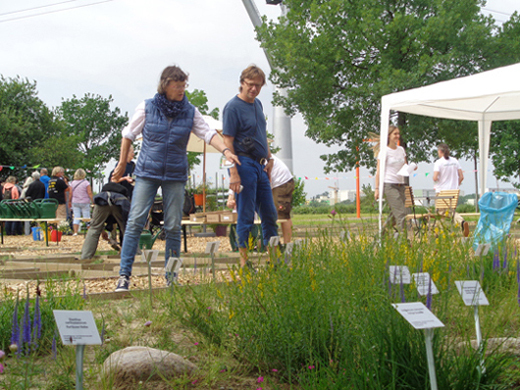 There is also a huge park in Hellersdorf with exhibition “The gardens of the world’. The cable car was built in 2017 in order to make this park more assessable. I was skeptical about the idea using cable cars in urban environment. But after riding it in the heart of plattenbau neighborhood I changed my mind. It’s a surrealistic experience changing the weekday perception of the plattenbau neighborhoods. And it brings a lot of new visitors, enjoying the unusual views and changing their attitude to the city’s edges. 3. We visited a charming community-center in cooperative Wuhletal. Common breakfasts, game evenings, dance and music meetings are organized regularly in the 100 sq.m area by team consisted of the residents. There is a huge kitchen inside that could be rented for a whole day for 130 euro on weekends. It is so popular that the place booked 1 year in advance. 4. Public space design is simple and anti-vandal. A log in a yard as equipment for learning how to balance. The stones sprouted by grass as a sitting and climbing place at the same moment. A lot of clever decisions. The photos are attached.